Welcome to Villa Montessori Preschool Columbus! When you challenge a child and cultivate their unique interests, you’ll be amazed how much they learn and grow. If you’re a parent who wants their child to be inspired by the unexpected, intriguing and innovative, you’ve come to the right place! Villa Montessori Preschool is a unique preschool in Columbus, Ohio designed for the curious, the adventurous. We offer programs for Infants to 6-year olds. We have over 12 years experience integrating Montessori and Reggio – two of the most dynamic and inspiring curricula in the world. Our classrooms expose children to experiences that will stay with them long into their school careers. Centrally located in Polaris, Villa Montessori Preschool welcomes families from Columbus and the surrounding areas: Worthington, Westerville, Dublin, Delaware, Lewis Center, Galena, New Albany, Hiliard, Upper Arlington, Easton, Gahanna, and Canal Winchester. Contact Villa Montessori Preschool Today! At Villa Montessori Preschool, it’s our job to make your child’s first learning experiences a little less ordinary…and a whole lot more memorable! Call 614-721-4410 or use our contact form to schedule a tour or request more information today. 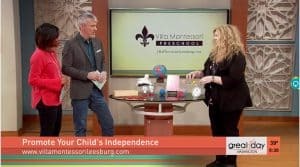 Watch the Executive Director of our sister school in Leesburg, VA Talk About Montessori and Reggio on Great Day Washington!